So, this week is my first week of doing "preschool" things with my kids. I plan on going over to the Onslow County Partnership for Kids to see if I can pick up some learning materials to work a theme around. If there is time. I would like to swing by the library and get some related books. Last semester, I had to make activity lesson plans for various age groups. For my preschool plan, I made a button board. I believe I found it on education.com (they have a lot of fun ideas). It's a great way for kids to practice actually making shapes by wrapping yarn around the buttons, grouping by button characteristics (size, color, number of holes), and practice creativity by making their own pictures. So, here are the button boards. They were good in the car too, except my 2 yr old needs supervision because he's still in destructive mode and tries to pull things apart. Switching gears, I managed to get 2 kitchen dishcloths/washcloths done over the weekend. 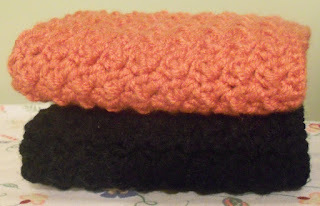 I made an orange and a black one to go with the black kitchen towel. I'm also working on an orange kitchen towel which I'll prob feature tomorrow. With these fabrics I'm thinking either one piece for a potholder or a set of 4 coasters. I'm leaning more towards the coaster sets. What do you think? For this one, I'm thinking of making these into squares for a table runner. picture quality is not too great, sorry! These are some Halloween Fabrics I have...quilted table runner maybe? So, the purpose of this post is to try to get motivated for the week. I wanted to show you some of the projects I would like to get around to doing and am hoping this will help motivate me to get moving on them! Check back tomorrow for WIP Wednesday! love that button board item. I've been thinking of what to do with my 4 year old grandson. I found you from the etsy blog team, and now I'm a new follower.